Complete website solution, including web design concept, programming development, flash elements, content research & writing, photos, SEO, Internet marketing, tracking & monitoring, domain and hosting, as well as a number of updates - at no extra charge. In addition, Web-Conceptions helped PPS Moving management set up e-mails & to receive them on mobile phone. This included face-to-face education & explanatory sessions, as well as support. Long established in the Cypriot packing & moving industry, PPS Moving has been serving consumers, as well as many commercial operations for over 50 years. The company's reputation has been built on solid customer service & in turn word-of-mouth - a common business practice in a community-orientated market. Today, things have changed somewhat. Globalisation (i.e. Cyprus' entry into the EU) has created a larger market, greater competition & technological progress, including new ways of searching for a service. Indeed, the Internet has become a primary tool. Realising this, PPS Moving knew they had to expand online in order to continue growing as a business. Of course continue to offer the personalised, expert & added-value packing & moving service they have been doing for so long. PPS Moving had very little prior knowledge about the Internet or websites. As such, full creative & technical control was passed over to Web-Conceptions. The main purpose was simple: boost awareness & increase sales, both within Cyprus, as well as internationally, i.e. anyone moving to Cyprus. Due to the nature of the industry, this purpose was twofold; to target consumers & trade. In other words, packing & moving co-load projects with other suppliers around the world. It was important to convey the essence of PPM Moving; as a professional, experienced & diverse company. Extensive content, clearly explaining what service are available, information about the company's history, & numerous testimonials. All had to be displayed in a clear, concise & easy-to-navigate manner. Thus, design was also fundamental, together with complementary photos, key word titles & phrases. Other strategic website components included a contact form, online quote form requesting specific detail & relevant reciprocal links. 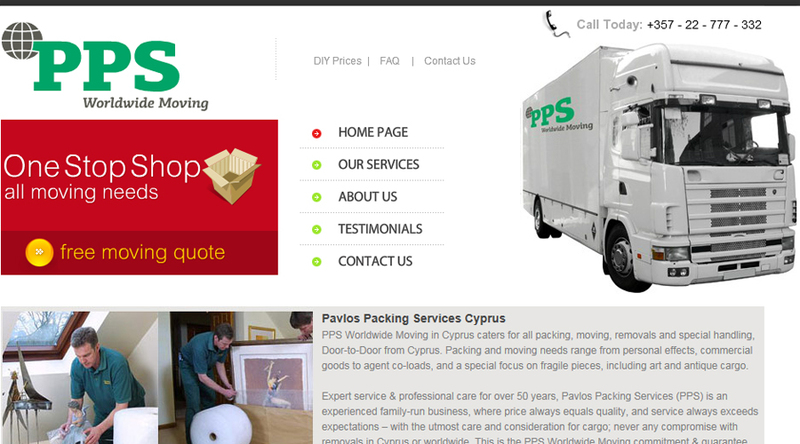 Overall, the website had to look professional & pleasant, but serve its purpose on being informative & ranking very well when searching for key words such as "packing & moving worldwide Cyprus", as well as with other words relevant to the business, including "antique, fragile, removals & Nicosia". In terms of design, the website truly speaks for itself, with all information clearly presented & all functionalities operating well. In terms of performance, PPSMoving.com is littered on any major engine (Google, Yahoo, Bing, Ask Jeeves) with the keywords words "packing & moving, worldwide, Cyprus or Nicosia"; ranking first, second and many times, multiple positions. The success of PPS Moving's SEO is truly phenomenal. Business has increased substantially, with increased leads from both consumers, as well as agents from all over the world seeking a partner in Cyprus. There is no doubt that PPSMoving.com has become Cyprus' most successful website in its respective field, well ahead many of its direct competitors who are much larger companies, including international brands. Since lunching their new website and managing to achieve very high search engine ranking with all key words, terms and phrases, PPS Moving has managed to do work for an impressive list of global and national organisations and institutions, including the European Union and European Commission (as well as during Cyprus' EU presidency), Sothesby's, Smithsonian National Museum of Natural History, Cyprus Presidential Palace, UNICEF, Cyprus Ministry of Education and Culture, Cyprus House of Representatives, DESTE Foundation of Contemporary Arts, Cyprus Chamber if Fine Arts, Nicosia Municipal Arts Centre and the Cyprus Olympic Committee, to name but a few.